This year, why not help point people back towards the gospel with the following resources. Rachel Jones, the co-author of Finding More, shares the six things she learnt whilst writing the book. Andy Paterson (FIEC Mission Director), Rico Tice (Christianity Explored Ministries) and John Stevens (FIEC National Director) discuss the issues we face as we seek to share the gospel in our culture. 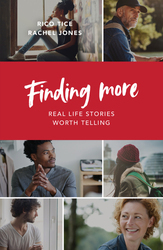 Today, in collaboration with The Good Book Company, we have released Finding More, a collection of stories of people who found the answer to life's biggest question. Christianity Explored Ministries helps people love, live and tell the good news of Jesus all over the world. Now we need your help. Today we are launching a year long matched funding campaign. As you seek to share the gospel this Christmas, we wanted to draw your attention to a few resources from our friends at Speak Life for use on your own social media or as part of your services. With just over a month to go until Christmas, Rico shares how he overcomes the challenges of personal evangelism, his most encouraging evangelistic moments and why Christmas evangelism is so vital.